My family and I were driving from Las Vegas to Bemidji, MN for our annual vacation. I have been going up to the lake almost every year of my life. We decided to drive because my wife and I wanted to bring up our bicycles. There are some really great bike paths in Minnesota. 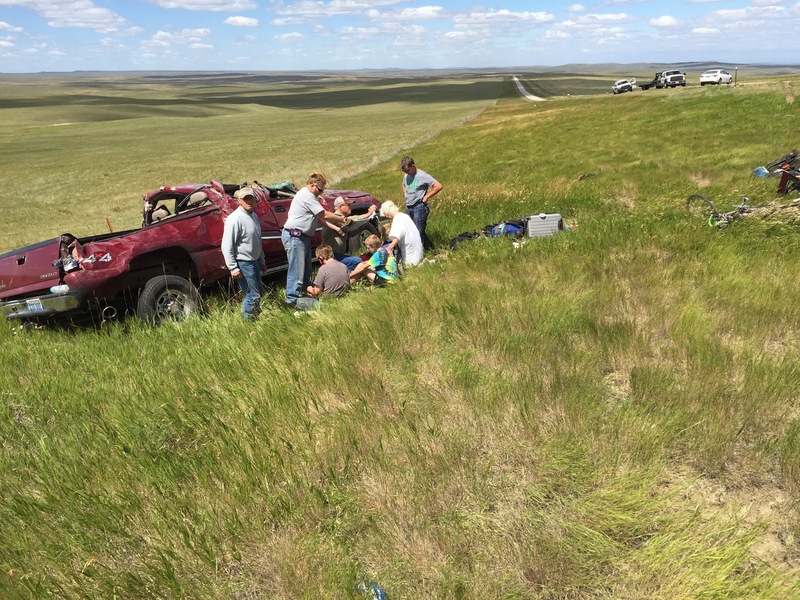 Our journey took an unexpected turn in South Dakota when we had a blowout. I lost control of the truck and we left the highway. The noise was incredible as we rolled over at least twice and then it was replaced with silence. I quickly checked the family. They seemed OK. Cuts and scrapes everywhere, but we were conscious and able to talk. The next step was to call 911. Where was my phone? It was on the center console, but there was very little inside the truck now. My wife’s phone was gone. My younger son’s phone was gone. Fortunately my older son has his phone in his pocket. I was able to reach 911. My boys were able to climb out through the back window, as the truck’s shell was gone. Some people helped my wife out and others pried my door open. I noticed that I was missing one of my sandals. I wonder where it went. We were quite a ways from the nearest town so emergency services took some time to reach us. By now, however we had a number of good Samaritans who stopped and were helping us. As they attended to my family, I surveyed my truck. It was clear that this truck was totaled. But it protected us. People started collecting our stuff and put it into a pile. Surprisingly, they found the three phones that flew out of the truck. That was very comforting. My iPad was also found, but somehow it seemed to have lost its protective case. 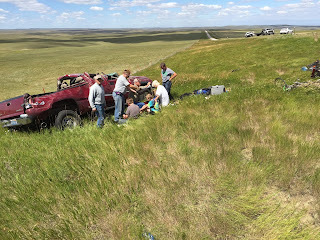 I started notifying family via text message that 1: We are OK, 2: The truck blew a tire and we rolled over, and 3: We were going to the hospital. When the EMTs arrived, one question they asked was what medications were we taking. I knew mine and could come up with a few of the medications the rest of my family took. Unfortunately I couldn’t think of them all. Why hadn’t I put them on my phone? 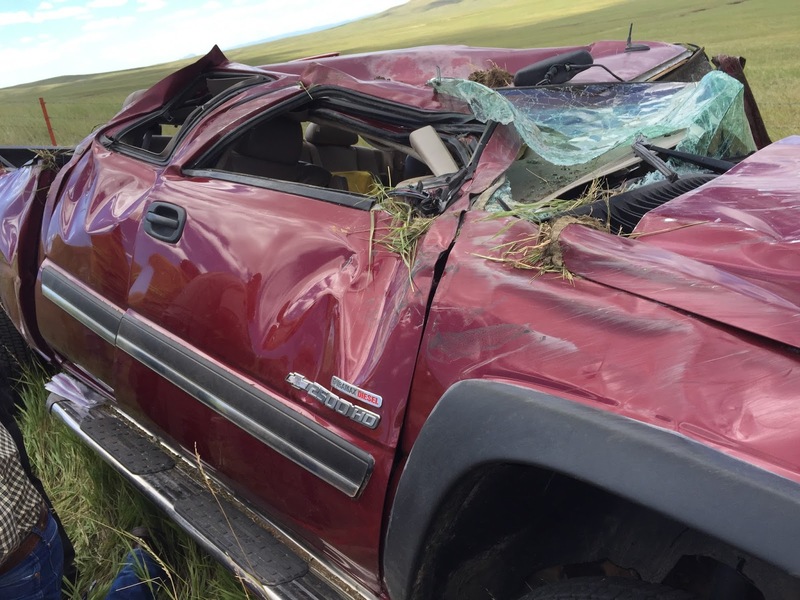 We were transported in three ambulances to Spearfish, SD. Our ride was about 45 minutes long. I was in the ambulance with my younger son and was glad to be able to hold his hand as they poked and prodded him. Older son: Broken arm and foot, lacerations to his face, hand, and chest. Me: Little cut on foot. I contacted my insurance company and started going through the process. This is where I found out I had made a mistake: I didn’t have rental reimbursement coverage on my cars. Not having it saved me a small amount of money. We have four cars for three drivers, so why would I need it? I never thought that I would have a problem in a small town in South Dakota. When I was talking about all the personal items that were broken with the insurance company, I found out something interesting. They aren’t covered under my auto policy. Instead, they are covered under my homeowner’s policy. And of course, subject to another deductible. The hospital suggested I contact the only car rental place in town before they closed. I called them up and was told, “I’m sorry, but I’m out of cars right now, except for one minivan.” Perfect! I need lots of space to carry everything we had in the truck. I got the van and with my younger son, who had now been released, we went to the tow yard where my truck was. They helped me load up my bikes and all the stuff from the truck. It was tight, but we got everything in. The hospital released my wife and son, but my wife now needed a back brace, which would have to be picked up in Rapid City, about an hour away. We would have to get it the next day as it was now late and the office was closed. Finding a hotel room was a struggle, because the 75th anniversary of the Sturgis Motorcycle rally was next week and almost everything was booked. I was ready to head back home to Vegas. Everything was horrible. 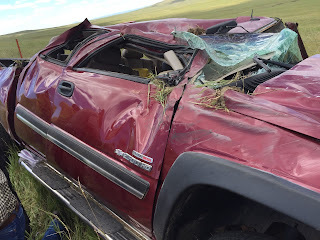 My family was injured and my truck was totaled. Driving home seemed logical to me. My wife, however, suggested we continue on. It would be quicker to drive to our cabin in Minnesota than home in Las Vegas. This made sense. The next day, we got my wife’s brace and finished our trek to Bemidji, MN. It was great to be with my parents and my sister with her family. 1. Keep your cell phone in your pocket while in the car. 2. Rental car reimbursement is important to have if you do any travelling. 3. Make sure your homeowner’s insurance is up to date. 5. Have a list of your family’s medication stored on your phone or somewhere handy. We are healing fine and will have a new truck soon.